One of the most popular amplifiers of all time lives again in the ’57 Custom Champ. Renown for it’s flexibility, ease-of-use and knockout tone this is the classic sound heard on thousands of recordings. A wide variety of playable tones inhabit this hand-wired performer—from crisp, classic cleans to naturally compressed overdrive that responds remarkably to guitar volume and picking dynamic changes. The Fender® 5F1 circuit used in the ’57 Custom Champ has become legendary for its heightened dynamic response and sweet sounding tube overdrive when pushed. A 12AX7 preamp tube matched to a classic 6V6 power amp tube generates this in-demand overdrive. When the volume is cranked, this little wonder sings with the natural compression and rich even-order harmonics of a power tube working at peak output in Class A topology. The 8-in. Weber Alnico speaker stays true to the classic Champ sound, compressing to create fat tone at higher levels while more than ably reproducing the raunchy tones found at the top of the amp’s volume knob. The hand-wired circuit includes newly sourced yellow coupling capacitors chosen for their authentically vintage Fender tone—sparkly cleans and creamy overdrive with smooth top end and round mids. 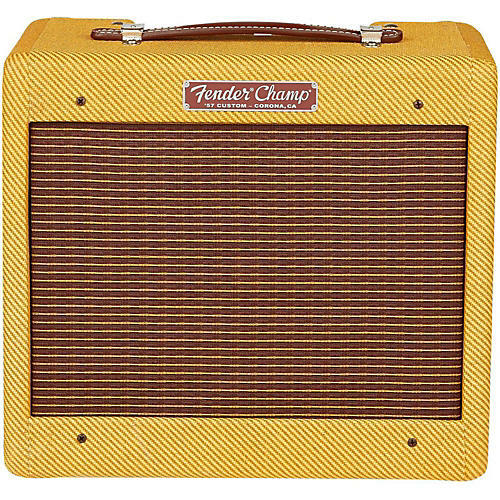 Onstage this amp looks great, retaining classic Champ visual appeal—lacquered tweed, chickenhead knob, leather handle and 1/4-in inputs for low or high output instruments are all here. In the studio, the 5-watt design means you’ll be able to explore the full range of available tones without overloading sensitive microphones (or your ears). Updated components, hand-wired craftsmanship and a classic circuit design all combine to create the ’57 Custom Champ, a style-spanning performer. Includes a protective cover.